The weather may be cold and dreary, but engaged couples throughout the Indy area are already planning for warmer weather. If you’re a bride or groom scheduled to get married next summer or fall — peak wedding season — now is the best time to book an Indianapolis wedding DJ. Most wedding planning experts recommend booking a DJ for your wedding at least 6 to 9 months in advance. A professional DJ entertainment company provides more than good music. They help manage the flow of the entire event, making sure everyone from your grandmother to the kids enjoys the party, and most importantly, they’re reliable. Don’t wait until the last minute to hire a part-time DJ who may leave you stranded. Unfortunately, we see it all of the time. The best DJs book up fast this time of year, so make an appointment now to pick the perfect MC for your fair-weather wedding reception. 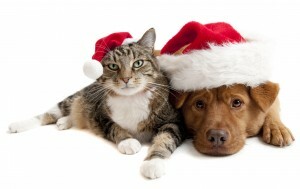 You can check our availability here. Once you’ve booked the perfect DJ, give yourself plenty of time to select what kind of music you want played at your wedding reception — and what music you or your significant other do NOT want played! We make the process of creating a wedding playlist easy with an online planning tool available to all clients. You can also upload timelines and any logistical notes so we can be sure to stick to your schedule and make sure all other vendors are on the same page as the big night unfolds. With our extensive wedding experience, we’ll ensure your special event flows smoothly and stays fun for all involved. Why worry about what’s next on the reception schedule when you could be dancing it up with your wedding party or visiting with guests? Take some time to plan a few fun elements that adds to the party atmosphere or turns your dream wedding reception into a princess-style affair, like low-floating dry ice that looks like you’re dancing on a cloud or monogrammed lighting to proudly display your new last name in the venue. 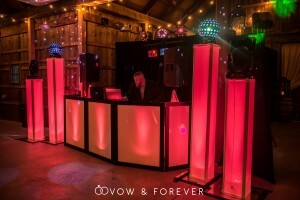 Our Indianapolis DJ services extend well beyond the basics. From a photo booth where your guests can create shared memories to all kinds of special lighting effects, we offer a variety of custom packages to make your day even more memorable. Get in touch with us today to schedule an interview or book your 2018 wedding now. Happy Halloween from Music Lifeline DJ and Photo Booth! I wanted to take a few minutes out of this spooky evening to talk about the fun of a Halloween themed wedding. In the past we had the privilege of deejaying a wedding on Halloween. The bride and groom went all out, and dressed up as Morticia from the Addams Family and Dracula. The entire wedding party walked down the aisle as goblins and ghouls. One of the bridesmaids dressed up like Cousin Itt. Lighting played a major role in the creepy decor. The altar was made up of an arch and a backdrop with our special string lighting. The entire room was decked out in uplights. There was special uplighting on each side of the room called a quad beam. It added a balance between spooky and elegance to the room. A layer of fog filled the room during the reception. It, paired with the dance lighting, completed the eerie look and feel. The room was filled with pumpkins. This included the front hallway near the guest sign in book and the centerpieces. The pumpkins were complimented with fall leaves. The centerpieces also included Mason jars with willows and candles. To keep up with the Halloween theme, spiderwebs were everywhere (even on the arch). Spiders could be spotted on the webs, waiting for their next meal. The ceremony was outside. The guests sat on bales of hay in true rustic, fall fashion. Normally I provide music for ceremonies. In this case, the bride and groom had friends of theirs play the guitar and sing. I did give them microphones and a PA system. The officiant performed a nice and simple ceremony. The pumpkins and leaves were also outside, along with old windows at the end of the aisle. It was a bit chilly that day, but luckily the ceremony was not too far away from the reception indoors. To warm up the guests, chili and hot chocolate were served. The other food consisted of vegetable, cheese, and fruit trays. The first dance was very nontraditional. The song was from Iron Maiden. It was a first for me, definitely not a waltz. The rest of the formalities were more traditional. Once we opened the dance floor, the first person to jump out on the floor was a young boy with a lot of enthusiasm. He was dressed like a member of the Blues Brothers. The dance floor was packed all night long. They had a wonderful celebration. The music selection was a classic wedding base with a twist. That twist was heavy metal and alternative metal. This allowed us to balance the bride and groom’s personal taste with the guest’s general taste in music. Weddings do not have to be traditional. They are a wonderful opportunity for brides and grooms to show off their unique personalities to family and friends. This is one example of a Halloween themed wedding that was enjoyed by all that were in attendance. We would be honored to help you plan yours. Call us now. 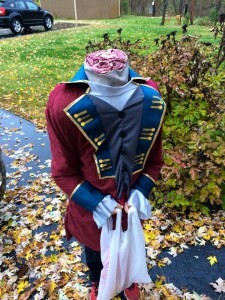 The Headless Horseman is standing by. Hahahahahahaha!!!! Out of all of the weddings we provided our dj services for in the Indianapolis area during 2016. Avon, IN seemed to be where we got to set up, the most often. 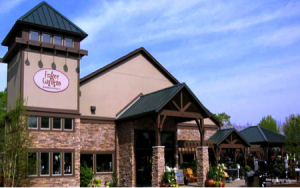 We did several weddings at the Avon Wedding Barn, the Avon Gardens, and Prestwick Country Club! We also stayed very busy in nearby areas as well. We always have a good time at the Lizton Wedding Barn, The Palms Banquet and Conference center. We had an amazing time spinning music at each and every single one of these venues and so many more venues like the new Mallow Run Winery. 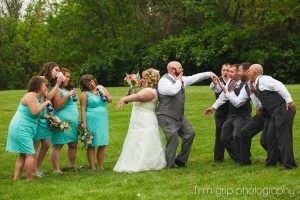 Our staff at Indianapolis wedding DJ’s truly appreciates the opportunity to go into each and every one of these venues and play their hearts out! We had our Photo Booth at Land Sharks a few nights ago with their house DJ Chris. This year we did many corporate parties from fashion shows to Christmas parties. Our corporate clients range from Giants like: Wal-Mart, SafeCo, YMCA and to little guys like apartment complexes and electricians. We customize each and every single party to fit our client’s individual needs. I believe that is something we have always excelled in. We’ve had many cultural experiences this year as well. We had a fantastic time at the Scottish Rite Cathedral this year. Talk about a lot of dancing and fun! The venue itself raises the bar for any party! We were fortunate enough to run into a couple of friends that were working there that same night. It is always great to work with friends. We just celebrated our last wedding of the year 2016. I am happy to say that we absolutely went out in style at the new Jamestown Wedding Barn! What a beautiful new venue and very friendly staff. The firework show was out of this world! I feel very blessed to do what I do for a living! Not many people can call themselves an artist and successful in the same sentence. I’ve been in the business for going on almost 11 years, what a long and strange road it has been. It has brought about so many memories and hilariously entertaining nights! One truly couldn’t imagine without walking in my shoes for a day! The crowd feeds me with entertainment as I feed them with energy each and every night I play my dream. 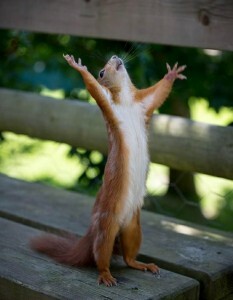 I may have the worst sleeping pattern a man could ask for, but it is worth every lost hour of sleep by a long shot! Can you even imagine spinning records around Indianapolis up to 7 days a week? It’s insane! I am having the time of my life, but I am starting to slow down the number of events I do per week due to hearing loss. When you do well over a 100 events per year with speakers next to your head it begins to take it’s toll on your hearing. I wouldn’t trade my experiences for the world though. Every weekend I am reminded of what Love really is! Destiny has found me ☺ ☺ I mean, my soundman and stage setter has worked for Michael Jackson, Bruce Springsteen etc. He works for me now!!!!!!! If you see me on the one and two’s in the Indianapolis area come up and say hello! Above all, we appreciate all of our clients and the commitment from our employees in 2016. We hope 2017 becomes our best year yet! Indianapolis wedding DJ’s Music Lifeline DJ and Entertainment Service would like to take this moment to wish you and your families a Happy Thanksgiving. We are so thankful to have had the opportunity to share special times with you during the year. We thank god for the goodness he brings to all. Indianapolis wedding djs,indianapolis wedding dj, music lifeline dj and photo booth. We are honored to be a part of the Frazee Garden Party and fund raiser event Saturday September 24th from 7:00 p.m. to 10:00 p.m. in Brownsburg, Indiana. This is going to be fun party with music, dancing, and food. This will be a fund raiser for Hendricks Regional Health and one big party for Frazee customers. A great evening and we hope to see you there. This year, we were fortunate enough to have provided the wedding entertainment for several spectacular Newly Married couples. One of our recent wedding events, was that of Trisha and Jason Chan. Before the wedding, we had the pleasure of getting to know this lovely couple. Our initial meeting was at the Historic Rathskeller in Downtown Indianapolis. Upon meeting Trisha and Jason, I could tell right away that this couple was truly in love. They lit up the room with their love and excitement for one another. As we spoke more about their wedding details and answered their questions; I could tell right away that this wedding and reception was going to be just magical. On July 30th, the couple began their new chapter in life. Their enchanting Ceremony was held on the East side of Downtown Indianapolis, while their reception was at the stunning rustic Avon Wedding Barn. Everyone was ready to celebrate this joyous occasion. 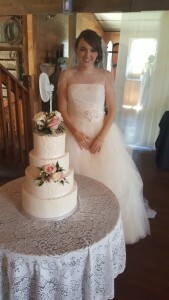 We were fortunate enough to catch the eloquent bride with her beautiful cake before their guests arrived. Trisha’s mesmerizing smile flourished as her dreams had came true. The reception was illuminated by romantic twinkling lights and alluring chandeliers, while the tables were draped in lace and pink roses. Trisha and Jason were glowing and ready to start the night off, with cutting the cake to Jason Mraz “I’m Yours”. It was a true sentiment of their love. While their guests enjoyed the delicious cake, they were captivated by the couple’s love for one another while dancing to Etta James “At Last”. Two beautiful families rich in culture, while some traveling across the world came together to celebrate Jason and Trisha Chan’s devotion to one another. We are very honored and proud to be selected to entertain and witness such a joyous event. Their love permeated the air and filled everyone’s hearts. The titillating crowd kept the dance floor rocking until the very last song of the night. They hooted, hollered and grooved all night! Even if it was one of the hottest days of the year! It was truly a unique exciting experience for us here at Music Lifeline DJ and Photo Booth. This is the kind of event we live for! It was a true fairy tale wedding. The bride and groom left graciously in a Limo while their guests were shuttled back to their hotels. Everyone was so kindhearted and generous. It was an absolute pleasure in meeting everyone at the reception. We cannot express the gratitude in our hearts for letting us provide your wedding entertainment. We are truly blessed to have worked with you all. Each event was as beautiful and unique as the last. Thank you all for the lasting memories and the opportunity to be apart of your special day. Congratulations to you all and may your love grow upon each day and be filled with joy. Indianapolis wedding dj, Indianapolis wedding djs, Music Lifeline is now offering Brides and Grooms their first dance on the clouds. 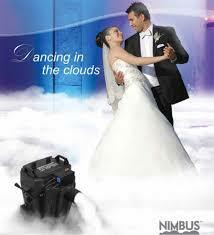 We have recently purchased a Chauvet Nimbus dry ice, low lying fog, professional fog machine to add special effects to your first dance. Your first dance as MR. and MRS will be even more special for you with the WOW factor. Give us a call for more information. Thank you Indianapolis for voting us a 2015 Wedding Wire Couple’s Choice award winner for the second year in a row! We strive to create memorable and unique for our clients and this honor means the world to us! You can visit our Wedding Wire page here for more information and preview some of our reviews below!